As you climb up over the ridge from the barrens, tired and dusty from your journey, you are surprised to see a bustling campsite below. After some time you see the campfire's smoke carrying the wonderful aroma of roasting meat and fish. You look out upon the lodges of the Red Savages, the beautiful inahans (slaves) as they go about their chores. You are surprised to see a Warrior quietly watching you as he sits upon his kaiila; a Yellow Knives warrior standing guard to his home. He stirs a bit, you see his bow ready if need be, he waves you on quietly. "You are entering the Yellow Knives camp, leave your preconceived ideas behind you. We do things our way here." Once more you make you way down the narrow corridor to the camp. Welcome to Yellow Knives, a camp of Red Savages from Gor. It is nestled in the Barrens or the Outlands, which it is some times called. Though it is called the Barrens it is far from that. 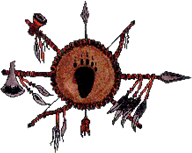 Life here is abundant from the wild animals that roam through it to the singing dancing inhans that dwell within it and the beautiful Free women who create crafts to the strong mighty warriors that protect every inch of the camp from any outlaying threat there might be. The camp, which is made up of literally thousands of acres, lays between the South Kaiila River and an east-northeasterly forking branch of the South Kaiila River. The river is a great source of life, adventure, play and food. 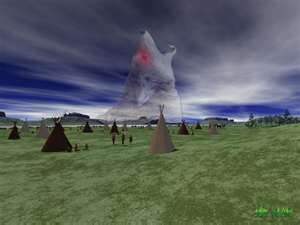 It is not the only source of food though as the land itself is filled with rolling lush prairie grass filled with flowers, herbs, and shrubs along with game that the scouts are always on the look out for as they guard the camp from harm. Many of the larger hills are used for look out towers to help keep the camp safe and some have been dug into and are used for . One of these hills is located in the middle of the camp. Burrowed deep in the hill lay many major buildings. The top of the hill is always guarded by the great warriors of the camp, so the buildings inside can not be raided. The camp is surrounded as well by tall poles strung with tarn wire to prevent any tarns from landing in camp. Nothing is out of view of these great warriors. They can see as far as the Voltai Mountain Range on both sides and any that moves on the Kaiila Rivers. No one approaches without being seen and the inhabitance of the camp are always ready to welcome an old or new friend asking them to share our fires or meet them with steel if it is required. The main camp area is situated well within the boundaries of the Yellow Knives territory at the western corner so it is constantly under protection. Nothing gets to the main camp unless the great warriors allow it. From the main camp you can hear the mellow calming sound of the swirling water and the swishing grass. The entrance of the camp is boarded on one side by the river and the other side by a sleen run. It is a narrow strip of land that brings you right into the heart of the camp where you will see the hustle and bustle of life in Yellow Knives. As you enter you gaze upon a large circular space in the very middle of the camp where Tribal members like to join together. Behind this area is a large tent over 35 feet tall and the size of a barn found on Earth. Inside of this tent are many chambers which are used for sleep, interviews or Council meetings. It is richly furnished with furs, various furniture and amenities of a prosperous people on the Barrens. Extending out from the tent is an awning framed on woodwork. It covers the audience area where all come to congregate to work and socialize when the weather is bad or the sun burns down hot, scorching the ground. This awning is covered in a thick silk waterproofed cloth black with gold pinstripes. The trim that borders it is embroidered with a design of a gold knife and feather crossed on a rich black background, The colors being reversed in the hotter months so that the background is gold and all other decorations are black. The awning is specially designed so that it can be rolled back or left to provide shelter from the elements and has a smoke hole in the center right above the main fire. They are wealthy people and have relativelyeasy living conditions, notwithstanding they are Red Savages of The Barrens. They are hunters and Warriors in nature. The Warriors rarely wear anything beyond leather leggings, a breechcloth and boots with a fur cape when it is really cold, along with his weapons of course. Council tents are adjacent to the main camp area. The majority however, are scattered in neat rows throughout the main camp. Just on the perimeters of the main camp circle is the hill that was spoken of earlier. It is situated just to the northwest and raises up hundred feet above ground. Imbedded into it's sides are three adobe and steel frame structures. the servery which faces the main circle, the slave dorm is to the right of the servery (this is only in the winter camp, in the summer camp there is a corral for the inahans to sleep) and on the opposite side of the hill is the tribal smokehouse, where butchering and preserving of the game brought into the camp is done. Atop the hill are 12 foot tall, sharp metal spikes adorning the surface in a forbidding forest preventing the possible landing of any Tarns or other creatures. Along the sloping sides are attached drying racks for Kailiauk jerky and other types of cut meat to dry in the open air. These are taken down at nightfall and replaced shortly after the dew has dried on the grass in the morning. The servery is the most enclosed of the three structures, with only the front wall of it extending past the hill being seen the rest of the adobe brick and steel framed structure buried deep within the hill itself. It's double doored front is usually left open. The winter slave dorm is set at the right of the servery with a narrow door opening at the end facing the east. This structure is the least embedded of the three adobe and steel frame buildings with only the storage areas at the very back actually covered by the hillside itself. There are windows along the top of the building. They are merely slits and have metal panels on the inside that can be closed and locked and are normally kept at least hallway covered. Their position from the ground and the narrowness of the window needless to say makes it impossible for anyone to reach inside or for a slave to exit the building through the window. Along the outside of the slave dorms are punishment cages which are chained to the actual side of the wall. All have a multi-spiked solid metal top, which stick up a full six inches making walking on the cages a bit improbable. On the inside of the entrance there is a special switch known only to camp members to shut the door in case of an attack. The smokehouse is on the opposite side of the hill facing north. It also is embedded, only the butchering area which is open in the front is outside of the hill's surface. It is here that all animals from Hunts and Raids are brought to be slaughtered and then butchered into usable form. The actual slaughtering done by Warriors of the tribe while the preparation is done by inahans which is the name for slaves overseen by the Free Women of the Tribe. To the south close on the bare side of the hill is the medical supply tent. This is where all the healing supplies are kept and medkits can be resupplied there. It is also here that the special herbal mixes for the various teas, poultices and other healing mixes are stored. Of course the usual surgical equipment and bandages are found here as well. Extremely ill or injured patients are housed in a small room attached to the side of the Medical Supply tent and major surgeries are also performed in an adjacent chamber. Since slavewine has a medicinal purpose the barrels of it in bulk are kept here but put into botas once a month to give to the kajira then stocked in the servery the night before the doses are given out for convenience. On the far right and behind the Council tent is the Tarn cote. This is where the Tarns are kept and maintained. There is a supply tent adjacent to this holding all the Tarn Saddles, Tarn Prods and other equipment used in working with the giant birds. To the southwest of the hill is the Kailla pen. Along with a supply tent for the saddles brushes, feed and equipment is kept. Special buildings are also found here for the birth and training of young Kaiila. Directly south are the sleen pens, the verr pens and the vulo pens. For each set of pens there is a special supple tent holding the tack and feed for the animal. The training grounds are between the south Kaiila river branch and the main pen area. To the east-southeast of the Kaiila pen area is the Leather working tent. It is here that all hides are turned into workable Leather of various degrees of suppleness and thickness. East-northeast of the Sleen pens is the forge and weapons tent. Here all the weapons and supplies are kept and maintained that are not personally owned by the Warriors. The tribe blacksmith is in charge here. Directly southeast is the dancing and spar sand pit. Here the graceful arts are shown off. a slave feeling her belly flow through her soul and spills out through her swaying limbs. Warriors come and dance as well working to lead the sound and movements of the spar. At the south end of the dancing and sparring Pit is the whipping post. Back to the animal pens right o the left of the servery is a great garden where vegetables are grown off the land to feed the great inhabitance of the camp.